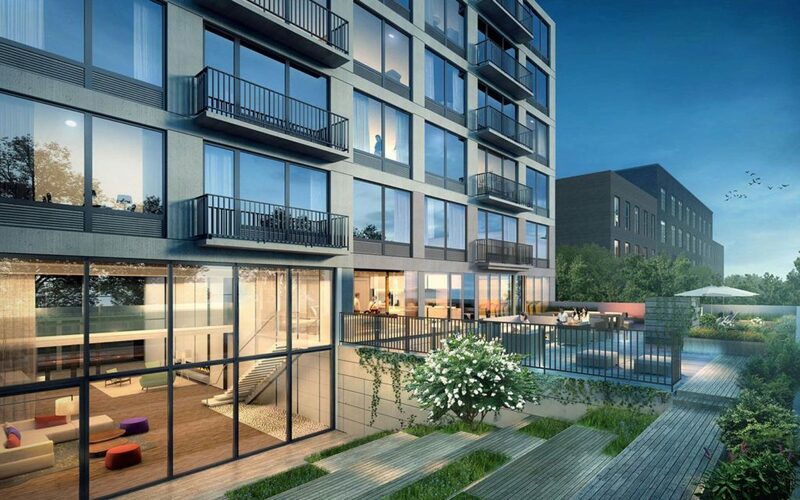 New York—Luxury New York developer Naftali Group has decided that it is time to let go of The Bergen, an 84-unit apartment asset in the Boerum Hill neighborhood of Brooklyn that it completed earlier in 2014. Savills Studley arranged the sale, landing a private European buyer that was willing to pony up $52.2 million for the asset and its very desirable location. The eight-story, 54,607-square-foot apartment property is condo-like in nature as all units feature solid white oak hardwood flooring, imported Spanish tile, high-end cabinetry, Caesarstone countertops and stainless steel appliances. In November, Urban Compass rented a two-bedroom in the building for $4,262 per month and a studio for $2,291 per month. An extensive amenity package might have something to do with those prices. The Bergen features a ground floor garage with 45 parking spaces, a gym, lounge, rooftop deck and a second-story courtyard. Select units have balconies, though all benefit from either floor-to-ceiling or ribbon windows. “This is an ideal investment for offshore purchasers; it offers safe returns and compelling growth prospects in a market that is well positioned for the future,” says Borja Sierra, executive managing director and head of U.S. Capital Markets for Savills Studley. This deal represented one of the first property transactions through Savills’ international network, just a few months after Savills’ purchase of Studley. If this deal is any indicator of what’s to come, the merger certainly benefited both parties.